Traditional dual sector model postulates that labour market consists of two different sectors. The model improves our collective understanding of labour market and explains the economic phenomenon in which different groups of people act as if these individuals participate in different segments of one labour market and receive different wages. Yet, economic theory provides little guidance on proper segments of labour market, especially in a low-income context. Economists Haroon Bhorat (University of Cape Town) et al. 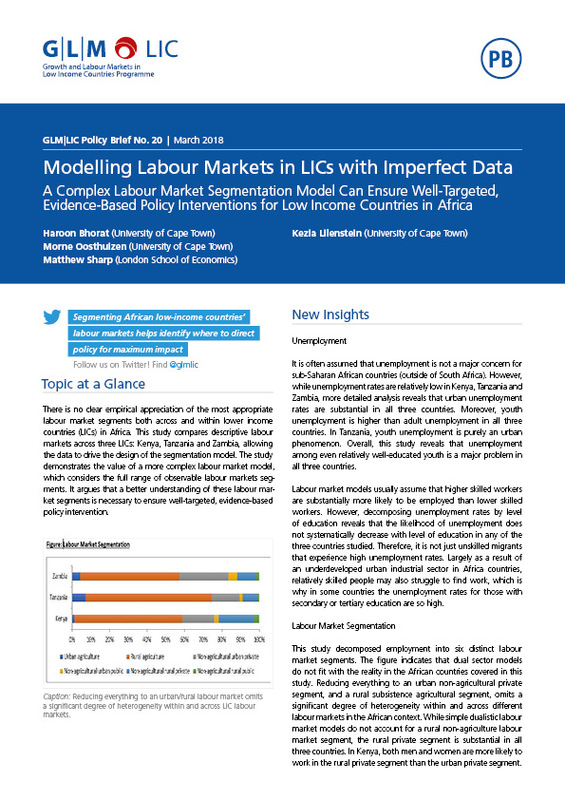 exploit data from Kenya, Tanzania, and Zambia to show the complexity of labour markets in sub-Saharan African countries. Despite sharing similar economic characteristics, GLM|LIC researchers are able to show the substantial degree of heterogeneity within and across labour markets by decomposing national employment into six different segments. Importantly, traditional dualistic model neglects other substantive labour market segments: In Kenya, for instance, the rural non-agricultural private segment is even larger than the urban non-agricultural private segment. A non-technical summary of GLM|LIC Working Paper No. 39 “Modelling Labour Markets in LICs with Imperfect Data” is now available free of charge.